Was it an accident? Did they realize what they were doing? Or are some NASA employees getting tired of supporting the lies? It is a drawing of what the Earth's sky would look like during the daytime if the atmosphere did not scatter sunlight. 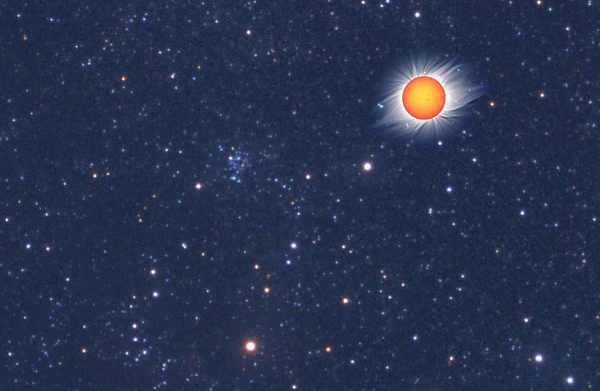 NASA admits that even with the sun shining, the stars would be visible. And would astronauts see stars as they traveled to and from the moon? Would astronauts in the space shuttle be able to see stars? NASA has been claiming for decades that it is nearly impossible for astronauts to see stars, but now the Astronomy Picture of the Day admits that without an atmosphere, we would see stars even when the sun is shining. I sent him an e-mail a couple years ago to "Get a clue!" Has Jerry Lodriguss finally figured out that the Apollo moon landing was a hoax? Or has he known it was a hoax for many years? Why would NASA put this on their website and admit that stars would be seen during daytime when there is no atmosphere to scatter the sunlight? Is it possible that people are starting to rebel against the corruption? Is it possible that people are tired of maintaining the Apollo moon landing hoax? Are American men finally behaving like men rather than frightened children? Or didn't NASA realize what they were doing when they put this page on their site? Will this particular page be deleted as soon as they realize what they just did? Will they frantically struggle to devise a flimsy excuse to explain this page? Anthony Colaprete is the LCROSS "Principal Investigator". Does he and other people at NASA actually believe that they sent people to the moon? Or do they all realize that NASA is just a big hoax? What has NASA done in their decades of existence besides lie to us and waste our money? Are the two Mars rovers (Opportunity and Spirit) really on Mars? Or are they in an Australian desert? Have you noticed that none of the astronauts who travel to the space station ever mention what the stars look like? Or what Mars or Venus looks like? If you were to travel to the space station and spend a few weeks up there, would you look out the windows? If you had an Internet site, would you post some photos and descriptions of your trip? People who visit Disneyland post more photos and descriptions of their trip than the astronauts! Doesn't this seem strange to you? Update July 2009: recently an anonymous person told me that one astronaut did indeed take some photos. I put the information into this article. Is Neil Armstrong shy? Or ashamed? Did you know that Neil Armstrong, the first astronaut on the moon, hides from the public? Did you see the information I have about him at this page? Update July 2009: He is also avoiding the 40th anniversary celebration of the moon landing! The Jewish media describes him as shy, but he seems ashamed to me. This article describes him as a "recluse who uses a fake name", and in this article his barber describes him as "very withdrawn". Armstrong foolishly chose to work with Zionist criminals, and as a result, he wasted his life hiding from the public and feeling guilty. He ruined his life for a group of criminal Jews. When you sleep with dogs, you get bit by fleas. Why doesn't he abandon the criminals and become honest? Is he afraid that the Jews will kill him, and that nobody will care? Did you read the report at newsmax.com that the son of astronaut Virgil Grissom accused NASA of murdering his father and two other Apollo astronauts? That article was erased or moved, but a Zionist propaganda site has a copy here, and this page points out that his family was ignored by NASA and the government. If the police don't care enough, or are too frightened, to investigate the death of Apollo astronauts Virgil Grimson, Ed White, and Roger Chaffee, would they care about, or be brave enough, to investigate the death of Neil Armstrong? Do you see any policemen in your city who have the concern or bravery to admit that Jews are responsible for 9/11? Or to complain about the Jewish lies and involvement in the world wars and HoloHoax? It's possible that Aldrin's family is mentally ill, which would explain why they suffer from depression, alcoholism, suicides, and who knows what other problems. It's also possible that some of the suicides were murders that were intended to keep the crazy astronauts under control. Will we ever find enough people who care that NASA is a group of criminals, murderers, and freaks? Update 20 July 2009: a monolith on Mars moon! 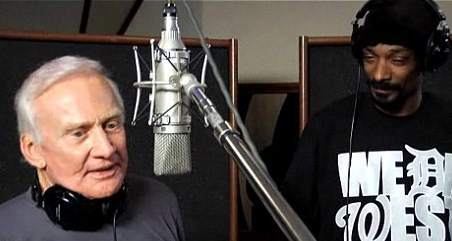 Recently Buzz Aldrin and Snoop Dogg got together to create a rap song to promote Apollo 11. The song is here, and a video of them making it is here. Why is Aldrin creating rap songs to promote the Apollo scam? Are his mental disorders so serious that he cannot be honest? Or is he afraid to stand up to the Jews? What is Snoop Dogg's problem? There are thousands, maybe millions, of black Americans who are constantly whining about "The Man", and from what I've seen, Snoop Dogg is one of them. So why is Snoop Dogg helping to promote the Apollo moon hoax? What's his problem? Is he just another freak who will do anything for money? If so, I'd like to know what I can get him to do for $40. A lot of people would like to be an astronaut, but it requires remaining silent about NASA's many crimes. NASA cannot let an honest or "normal" person become an astronaut. The only people they allow to be astronauts are people with psychotic obsessions to become astronauts. These mentally ill people will keep the secrets because they desperately want to be an astronaut. In other words, the astronauts are lunatics. This is why they exhibit so much psychotic behavior. (The photo is the mug shot of astronaut Lisa Nowak). The astronauts will do anything that the Zionist Jews ask them to do, such as claiming to see 8 to 9-foot tall aliens, as astronaut McClelland claims. He has also seen "Hyper Drive UFOs". Have you seen this pathetic astronaut named Ed Mitchell try to convince us of aliens on the Larry King television show? In July 2008, Larry King had this group (new link) of people "debate" whether UFOs are real. If that video gets deleted again, here is another of his UFO programs from November 2007. Will you ever get tired of their toilet humor? You ought to wonder what television, books, and magazines would be like if we could get the Zionist Jews out of our societies. They are using the media to manipulate, deceive, and confuse. Furthermore, these criminals have the mind of a child, so they fill our media with toilet humor. For example, this report from National Geographic News tells us that Buzz Aldrin was the first man to pee on the moon. Perhaps next they'll write a report about which astronaut was the first to poop on the moon, or burp, or pick his nose. People who are subscribing to National Geographic, or any of the other Jewish publications, are funding these disgusting criminals! Don't give these freaks any of your money, if you can avoid it. Remember, whenever you find a deceptive site, take a look at who they promote, and who promotes them, and you can find other deceptive sites. The Jewish crime network is gigantic, and they promote one another, and once you understand this, you can identify other members in their network. For example, AngelsForTruth promote the criminal astronaut McClelland and his lies about aliens. That site is from the same woman who creates Mothers For Truth. Notice that Jews try to manipulate us with subliminal messages, such as posting images of American flags, and implying that they are providing us with the truth. Don't let these criminal Jews outsmart you with their subliminal messages, or their claims that they are Christians, atheists, or "truth seekers"!